The Karabar Globe Traveler 85+20 backpack consists of twin compartment main bag with detachable daysack. The rucksack features padded adjustable shoulder straps and a padded hip strap. Additionally, the detachable daysack has extra padded shoulder straps and a carry handle. 3 Years Warranty! 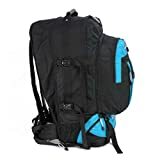 This entry was posted in Luggage and tagged Backpack, Black/Sky, Blue, Daypack, Detachable, Globe, Karabar, Large, Litres, Traveler, Warranty, years by Bottled Sun. Bookmark the permalink.